Staff photo by Tim Barber / Tyrone Murphy sits stoic inside Judge Barry A. Steelman's courtroom during jury selection at the outset of his murder trial on Tuesday, Sept. 11, 2018. 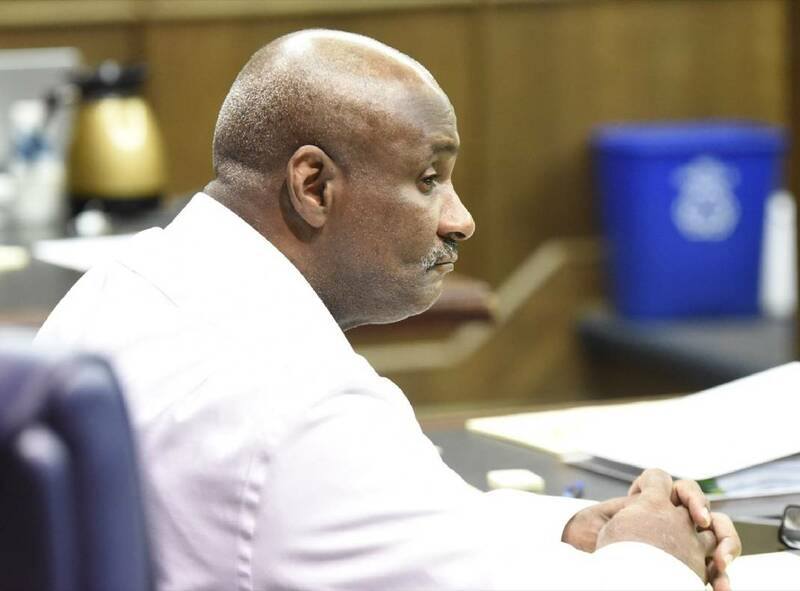 Staff photo by Tim Barber / Defense attorney Andrew Childress leans in to speak to defendant Tyrone Murphy Tuesday, Sept. 11, 2018. A murder trial began Tuesday for a 58-year-old man accused of stabbing his neighbor to death in 2017 and then disposing of evidence. Prosecutors say Tyrone Murphy stabbed his neighbor, Ashley Cates, 30, more than 15 times in her apartment complex at 1512 Bailey Ave. on June 4, 2017. Afterward, he tried to clean the scene, hid some of her mopped-up blood in a nearby laundry room and misled investigating officers about the slaying, prosecutors say. He is charged with first-degree murder and tampering with or fabricating evidence, and he faces a life sentence if convicted this week. Murphy's public defenders pleaded not guilty on behalf of their client. 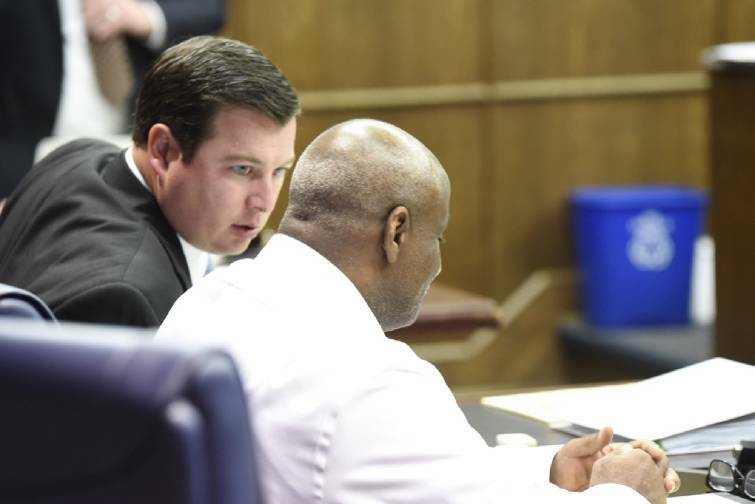 During opening statements, Assistant Public Defender Andrew Childress told jurors that Murphy got into a fatal struggle with Cates after he saw her "brandishing a weapon" near the staircase to their second-floor apartments. After helping select a jury, prosecutors focused their energy on the afternoon of June 5, when Cates' family discovered her body. Tim Mosteller said Cates, his stepdaughter since 2011, worried about living alone. On June 4, her mother, Janice, visited the apartment, and they ate pizza, watched a hockey game, and she left when it seemed like Cates would be OK, according to court testimony. "She had no idea that would be the last time she would see her daughter alive," Executive Assistant District Attorney Cameron Williams said. The next day, Mosteller said, his wife, Janice, realized something was wrong when Cates hadn't replied to her calls or texts. Mosteller said they drove to a friend's house where Cates was supposed to be pet sitting around 4 p.m. But she wasn't there. The couple then drove to Cates' apartment, and with the help of another tenant, managed to get into her room with coat hangers and other on-scene objects, prosecutors said. Inside, they found Cates on her back, her legs crossed and chest smeared with blood. Mosteller said his wife wailed as another tenant called 911. Prosecutors said officers who drove to the scene, specifically George Romero with the Chattanooga Police Department, discovered an important clue: smudged blood on the doorknob of Murphy's nearby apartment. Prosecutor Williams said officers knocked on Murphy's door about three times. After getting no answer, they barged into Murphy's room, found the 58-year-old sleeping, noticed fresh stitches on his hands and took him into custody. Williams said Murphy told investigators that he cut his hand on June 3 while moving a bag full of broken glass at his job at Sticky Fingers in downtown Chattanooga. "He tells police he didn't really notice two gashes on the right palm of his hand," Williams said Tuesday, "that he walks home from Sticky Fingers downtown to Highland Park and only after he got into the apartment, and only after he got into the bathtub, did he notice these serious wounds." At the scene, investigators also retrieved a large plastic bag from the laundry room with bloody towels and some of Cates' personal belongings, prosecutors said. According to court testimony, one other person at the apartment noticed something blue on Murphy's hand around the time of the killing but said Murphy offered her cigarettes and seemed his usual, "happy, go-lucky" self. Hamilton County Criminal Court Judge Barry Steelman sent jurors home around 6 p.m. and said the trial will continue today at 9 a.m. At that time, prosecutors will continue presenting their proof. Once they're finished, Murphy's defenders can call witnesses or present other proof.